Euroluce, the International Lighting Exhibition, runs every two years since 2011 and presents the most innovative solutions in the field of light for interiors and exteriors. Among the exhibitors, there’s DelightFULL, that is presenting many brand novelties. Get inside this big design event with this ebook! 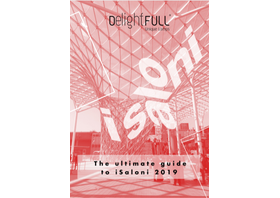 Milan will receive the 58th Edition of ISaloni 2019, but our focus will be the city, the city that was, back in the days, the capital of Italy, the main center of cultural and artistic changes that would be the most important for us to know it as it is today. Let’s pay attention to the city, what it has, what was build, why is the first city that comes to our mind when we talk about art, design! 21/01/2019 Maison Et Objet Is Here And We Can’t Hold Back Our Excitement! January edition of Maison et Objet always means big news, and with the returning of one of the biggest trade shows is what we have for you! Let’s take a look around at the stands: the big classics and the big news! Discover all about it at: http://bit.ly/2U5WcO2 Come celebrate design and watch Vintage Come To Life at Hall 6, Stand O102 and P101! From the minds of mid-century lovers came the idea to create a place that would celebrate this timeless design and architecture movement. With that in mind, we created Twist: the perfect place to fall in love with the simplicity of mid-century lines and the intricacies of its architecture. Maison et Objet is a major Trade Fair for Interior Design. Here you can find everything about M&O, such as Top Exhibitors, Conference, Designers of the Year and Inspirations! This is your City Guide to enjoy and discover Paris!